Are you looking for a high solids solution for any type of roof? EnergyGuard Elastomeric Roof Coatings has you covered. This product is instantly waterproof upon application and provides a seamless curing. It is very flexible, has a strong elastomeric coating, and can withstand even the most extreme temperatures. Our most popular option is EPDM coatings, which is 100% organic and behaves very similarly to rubber. You can use it for a new construction, repair, or replacement. Liquid EPDM can stand up to temperatures ranging from -62° - 300° F without any damages. WHERE CAN I USE ELASTOMERIC COATINGS? When you choose an elastomeric, you are getting top notch UV an ozone protection and are extending the life of your roof. Elastomerics are heat reflective which can lower your electric bill. You can purchase EnergyGuard Elastomeric Roof Coating from EPDM Coatings along with other options like Liquid EPDM and Liquid Rubber. Cost is budget-friendly and depends on amount needed. Contact a representative for a price quote. A 10-year warranty is available with certain restrictions. Our representatives are happy to provide you with additional information. Your EnergyGuard Roof Restoration System will vastly increase the life of your roof. However, routine maintenance can help extend your roof for even longer. Warning: EnergyGuard Elastomeric Roof Coatings can freeze. It is a water-based product and should be kept in temperatures above 32° F. If you live in a region with chilly nights, it is best to plan your project during the day. Do not expose the product to water, foot traffic, rain, dew, snow or fog until it has completely cured. Please sustainably dispose of used containers. Keep this product away from children and call a physician immediately if swallowed. Do not induce vomiting. Elastomeric Coatings are just what they sound like an elastic coating that stretches to adapt to different temperatures. Elastomerics have polymeric components including white pigment, acrylic, and titanium dioxide which makes them reflective. Apply this product thicker than paint for the best effect. A good pressure wash over the surface is the best way to remove dirt and debris. However, certain materials might need a detergent. We are happy to help you choose the best cleaning method. The best adhesion requires a primer. We sell primers for every type of roof, including completely rusted surfaces. Once you apply the product, you will never have rust again. Flash any openings including non-structural gaps, parapet walls, penetrations and seams. Cal fasteners or seal them with caulk. You wll never deal with leaks again. Ensure that there are no issues before applying the product. In just a few hours, you wll have a watertight, perfect coating. A high-pressure airless sprayer is the best application tool. 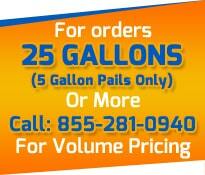 Choose a model with 3000 psi that offers a 3 gallon per minute flow rate.